Lake Pontchartrain, I’ve underestimated you. Or at least largely ignored you while I’ve lived in New Orleans—and you know what, it’s my loss. There’s something somewhat static or expected about the idea of a lake. Many of the lakes in Maine, where I’m from, could very well have more interesting hydrologic histories than I was ever aware of growing up (ancient freshwater trapped in glacial scars, no doubt), but for the most part, I tend to think of lakes as bodies of water with relatively low variability. Large puddles, essentially, that one can take a kayak or a rope swing to. Primarily unchanging, potentially polluted (not naming any names), and probably mucky on the bottom. Lake Pontchartrain, none of these things describe you! You are technically a lake, if a lake is defined as a body of water surrounded by land, but that is definitely not the best term for you. No, you are an estuary, one of the most productive types of ecosystems on the planet, thank you very much. Until recently, I thought an estuary was simply any brackish body of water—and that still may be true—but a more accurate definition of an estuary is the place where a river meets the sea, where freshwater and saltwater swirl together. That liminal place where a river is in the process of arriving. Maybe many of you readers already knew this about Lake Pontchartrain—but I didn’t, so bear with me! As I’ve described in a previous post, Lake Pontchartrain was formed a few thousand years ago by the interplay between a swinging arm of the Mississippi River (before it landed in its modern channel) and a relict, now-buried barrier-island chain that swoops along its southern border like a pearl necklace. Although that former Mississippi wanted to swing north, toward the center of the present-day lake, the sandy island chain prevented it from doing so, and it was forced to continue on its northeastern trajectory–forming an oval of earth-trapped seawater in the process. It would have sealed off the lake altogether, but it turns out the Mississippi wasn’t the only river in town. 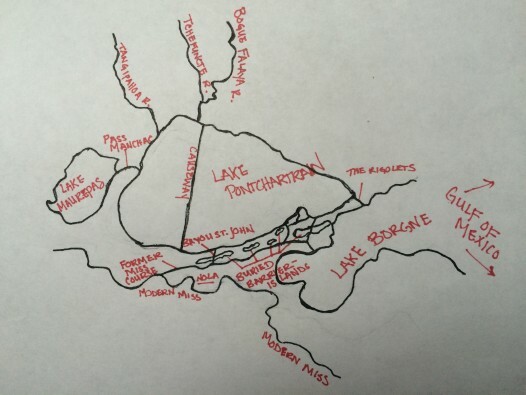 What about the Tangipahoa, Tchefuncte, and Bogue Falaya rivers, coursing into the lake from the north (badass rivers in their own right, boasting rich Native American histories)? They continued to empty their insides into our friend LP, and the water had to go somewhere! A river, no matter how small, must always make its way to the sea. The freshwater forced its way through the eastern edge of the lake, eventually forming the Rigolets and allowing salt water to enter in and out when it pleased. 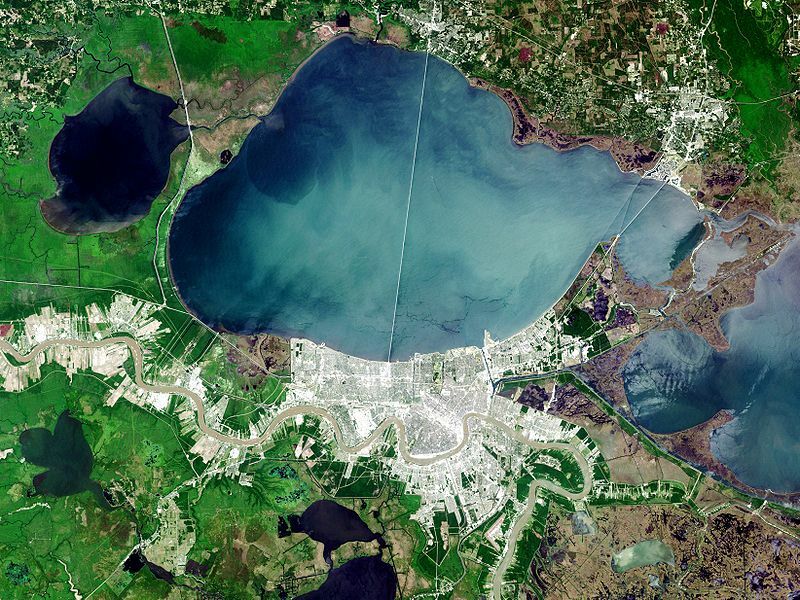 So, to say this another way: Lake Pontchartrain serves as an estuary for three very respectable rivers. When’s the last time you could claim anything nearly as cool? Lake Pontchartrain, you aren’t just connected to those Northshore rivers and the Gulf via the Rigolets, however. You connect to the Gulf via the Chef Menteur Pass, too, and Lake Maurepas via Pass Manchac. Now you even touch the modern Mississippi herself—via the Bonnet Carre Spillway and the Industrial Canal. And, since 2014, you connect to the Bayou St. John again! The metal door that had been shut tight between you for decades is now open, at least intermittently. You remind me of a broad, shallow heart, pumping water—salty and fresh—in and out of your various pathways and conduits, continuously. You’re a bit under the weather though, I should mention. Your wetlands are sediment- and freshwater-starved. You’re suffering, as this whole region is, from a lack of Miss River nutrients. It wasn’t always this way. A simplistic sketch of LP, by yours truly. LP touches six Louisiana parishes! St. Tammany, Orleans, Jefferson, St. John the Baptist, St. Charles, and Tangipahoa. Its average depth is only 12-14 feet! Its bridge, the Lake Pontchartrain Causeway, is the longest (continuous) bridge over water in the world, according to the Guinness Book of World Records. It’s also featured in this 1988 ode to New Orleans, by Lucinda Williams, which is what I will leave you with….